1 - Barbara H.: Hi Rafa, first I want to congratulate you on your match against Veic, where we could enjoy that 'drive' that we like. I have a doubt that I'd like to clarify: it is clear that to make a sign because they were all aces, but do you always trying serve an ace with the first sere? Or do you try to serve a good, strong serve and at times it turns into an ace? Many thanks and much luck! Rafa: Thank you for your support! No, I don't always trying to serve 'aces', on the contrary. The aces I try on important points, such as to get out of trouble in a tricky match or to win an important point of the match. Very different in the service, or at least that is what needs to be done. 2. Román Valero Azahara: Hola Rafa! What do you think that in a tournament as important as Roland Garros some have to stop a match because of darkness? Congratulations for your match against Veic, and keep adding! In passing, I congratulate you on your next birthday and the gift is biting the Musketeers Cup. Vamos champion! 3. Alberto Alburquerque Lizana: Hello Champion. You're the best Spanish athlete of all time. Why be a player with a big FH and a good backhand play a little defensive sometimes, and when you go down (scoreline) you become very offensive again? I think like always you will finish it with a win. A greeting. Rafa:I do not think that is entirely true but it's clear what I intend is to play well and win if possible. There are many influencing factors. Rafa:Thank you very much. And I hope that is not yet lost, but practically yes, We'll see how Djokovic does and what he has to do to be number 1. But hey, I always said it was not my priority. I'd rather win here than continue to be number 1, to tell you the truth. I look at the points of the year and end of the year is what counts. But it is difficult to understand for most. 5 - Fran Gal Ollero: Hi Rafa. I hope you can read and reply to this comment. First of all, and as a Barcelonista, say you're one of those who do continue to have respect for the R. Madrid. The question: someone like you, who has life settled on the economic level, are there days in which everything arises and you are not sure of anything? If not, is there anything in particular you do to keep up the mental strength to pull ahead despite the difficulties? Thank you and lots of encouragement. Rafa:Thanks for the comment. I think there are many more, not just me, we also want to win when the club played in Europe to be a Spanish team. Also they are playing unbelievable, is a marvel to watch them play and if you like football you have to like this club. As for the money, for nothing. We do not think the money and it does not have any bearing on my game. The important thing for us is to win titles. 6 - Nacho Boldova: Hi great Rafa, in life as in sport can not always be on top and the problem is that you have spoiled us very much, how can they say you are no longer the same? You've won two titles this year and has played six finals. The day you retire we will remember up to Rafa did not win everything, but there will be another like it. The Roland Garros is yours, I am convinced that the second week you will be exquisite. A hug champion. Rafa:Thank you very much for your comment. Rafa:Jajajajajaaja. Not my style either inside or outside the court so you are staying with the desire, jajajajaja. 8 - Alejandro Peiteado Valderrama: Hi Rafa, I send lots of encouragement to see if you get a new Roland Garros. I wanted to ask, had you ever traced a set like against Andújar like? (5-1 and 40-0 against). 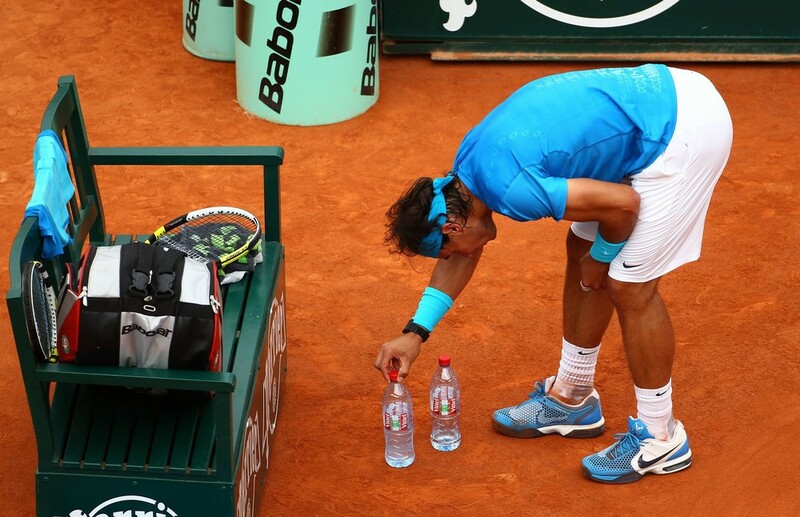 Rafa:Yes, it has happened to me. I remember a match against Nalbandian at Indian Wells, I was more than lost. I was hitting and beating and finally got to overcome it. The situation was very similar, but I way behind on the scoreboard. 9 - Carlos Bretons: Hey champ! You've always had a good FH, why do you think you don't have it now? Do not think that is only because of the pressure you feel about what you do not loose it with the FH? Get rid of pressure and Rafa Nadal know more than ever! Rafa:I think I have it, but it's true that it has not worked as usual. Little by little, I hope. And as pressure, I have nothing that is not new, it is the same as always. 10 - David Rodrigo Moreno: Buanas Rafa. I've seen your games and I am struck by the attitude of the public. I've seen a couple of times you've seen one bad ball the linesman has not called it, the chair umpire comes down and you right and people still hisses and boos, is that normal? If the ball is bad, is bad for anyone, I do not know what you think of this or do you not pay attention to it due to tension of the match.